Critics of astrology will often paint a picture of the subject’s followers as desperately needy and insecure people who will clasp at any illusion in an attempt to comprehend the unexplainable rather than face the fact that we are all floating in a hostile, anarchic and unknowable Universe. This like most of their utterings is complete nonsense. Everyone tries to explain people’s behaviour in terms of their past experience. What other methods are there ? The only way any of us manage to survive for 5 minutes is because our brains are continually looking for recognisable patterns from the vast number of impressions that are constantly served up in front of us. If the so called sceptics were not doing this using a sophisticated array of far more subjective pattern predicting, they would have died out long ago. If only that were the case. It may be that as astrologers, we share our particular choice of cosmic patterning with a few airheads, but that does not mean the system lacks the intrinsic rational of all other ways of processing and understanding causal or synchronistic phenomena. Any system that seeks to comprehend things is bound to give weight to factors involved. Someone trying to explain the particular behaviour of their grandfather who might have been afraid to leave his home town could say that it was because he lived through the Second World War. This may be a factor in explaining their ancestor’s antics but it cannot be recognised as entirely causal, for the very fact that everyone in their generation had the same experience. Capricorn Research has read pieces of astrological writing that has attempted to explain the behaviour of something like this because they had Pluto in Cancer. This is utterly absurd because they shared this astrological placement with every single person born anywhere on earth in the 25 year period leading up to the war. This kind of comment can only come from an understanding of astrology that is limited to signs alone but that also has no notion of time periods and probability. The importance of a causal factor in any explanation must be in direct proportion to the uniqueness of its occurrence. If we are talking about the importance of signs in explaining behaviour we would have to restrict our focus to the Ascendant, Moon, Sun, Mercury, Venus and Mars. We call these the personal planets because they stand for particular energies that relate specifically to the individual. But this is also because their duration in a particular sign is limited to anything from a couple of hours as in the case of the Ascendant to a few months at most in the case of Mars. The further outside of Mars’ orbit we go the longer the planet remains in a sign and therefore the more useless it’s sign placing is as an explanation of anything. Jupiter will take about a year, but Pluto would be about 20 years on average. So Uranus, Neptune and Pluto by sign can only really point to generational trends. It may be that certain individuals are more affected and representative of these trends but that could only be seen by using other factors besides the sign placing. The above grandfather’s agoraphobic behaviour could not be entirely explained by his living through the war, but it could be if his wartime experience was 5 years in a Japanese concentration camp. In the same way Pluto being in Cancer would not do the job but it could if it was in close conjunction with his Moon and Saturn in the 4th house. But this combination would require him to have been born just before midnight on a certain days during the 2nd half of 1914 or first half of 1915. The total range of possible birth times is not 25 years but about 6 hours. Given this kind of chart he would therefore have spent his late twenties incarcerated. That this time scale would have included the returns of both his progressed Moon and his Saturn would naturally reinforce the causal link to his later fears. So in order to use astrology as an effective tool for explanation we have to be much more specific in our focus. There are however some individuals who do really stand out as being representatives of the particular fashions and tastes of a generation. These people will invariably have charts with important individual placings like the Sun, Moon or Ascendant in a sign or part of a sign that is triggered by a slow moving planet’s transit through it. One exceptional example of this is the phenomenon from Pluto’s transit through Libra that is Abba. Abba was a Swedish pop group formed in Stockholm in 1972, the name is an acronym of the first letters of the band members’ first names, Agnetha, Bjorn, Benny and Anni-Frid. Abba have sold over 380 million albums and singles worldwide, which makes it the second best-selling music group of all time. It also seems particularly appropriate that the only group to top them, The Beatles were a 1960s Pluto in Virgo phenomena, very fitting as they emerged from a working class background in Liverpool. The main themes of Libra are partnership and equality, so its also fitting that the supergroup of the Pluto in Libra age was made of up two men and two women who were married to each other. It is usually difficult to find a chart that fits an enterprise as opposed to an individual, because the exact moment that it began or came into being is not usually known. So who knows what the birth chart of Abba would be ? There is one defining moment however, which a whole generation would recognise as the band’s very own Waterloo. The 1974 Eurovision Song Contest propelled them instantly to global stardom, so the chart that this article will use is this one. The Moon is in Libra, in conjunction with Pluto and although the orb is a bit wide and Uranus is bang on the Ascendant. The phenomenal success of this act could be shown by the Venus / Jupiter conjunction in Pisces. Most of Abba’s fans would say that the thing that brought them to such global stardom was their talent. They certainly wrote and performed some brilliant pop songs but let’s face it we are not talking Lennon and McCartney here. As true representatives of Libra, much of their success is due to the fact that they looked the part. And of course the one that most fitted the Swedish Venusian description was the blonde one. The connections between Agnetha’s chart and the Eurovision one are astonishing. The Suns are in close conjunction in mid Aries. And their Suns are both opposite a slow moving planet in Libra. In Agnetha’s chart this planet is Neptune, the planet of fantasy that is so often prominent in the charts of glamorous female stars or celebrities. But it will be seen that this Neptune in Libra is closely linked to the main planets in the charts of all 4 members of Abba. This created a focus point in the zodiac that was triggered by Pluto’s transit in the 1970s. Agnetha was married to Bjorn. The synastry is powerful. Bjorn’s Moon is conjunct Neptune but it is also opposite a Mercury / Venus conjunction in Aries. This sits on the Sun / Moon / Ascendant combination of the Eurovision chart but also exactly on Agnetha’s Sun / Neptune opposition. 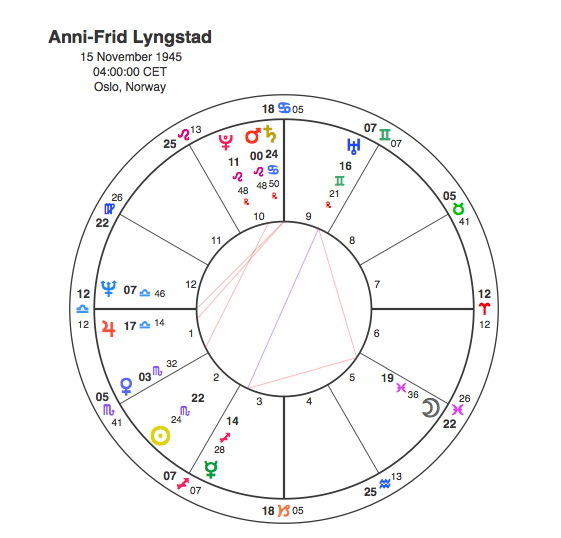 This also explains why Bjorn and Agnetha’s marriage was put under such pressure by the group’s fame and ultimately collapsed when Pluto opposed her Sun and his Mercury / Venus. The other couple were Benny and Anna Frid. Benny also had the Moon in Libra in conjunction with Neptune, in the 7th house of relationships to boot. He also had a close conjunction between Venus and Jupiter. This pairing was in Scorpio conjunct Anna Frid’s Sun. She also had the prominent Neptune in Libra, in her case conjunct the Ascendant. 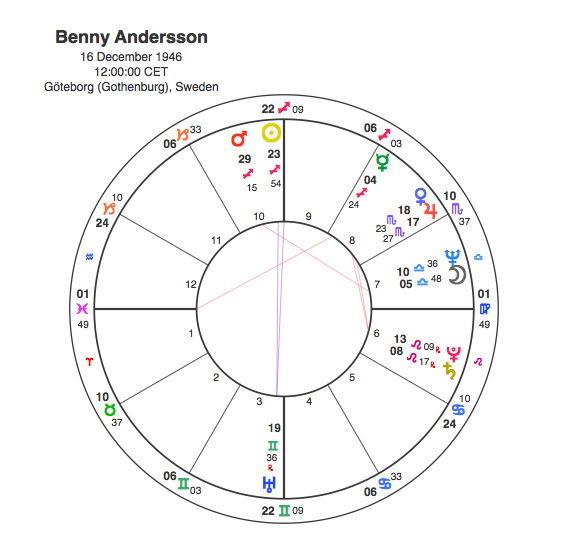 The synastry between Benny and Anna Frid was equally powerful as his Sun was at 24 Sagittarius opposite Uranus aspecting her Mercury and Moon. Fittingly as Benny had the Moon conjunct Neptune in the 7th, their marriage also dissolved in 1981 when the transiting Neptune was conjunct his Sun. That Abba were a Pluto in Libra phenomenon is confirmed by the fact that they formed in 1972 when the planet first moved into the sign and dissolved 10 years later during its final year before moving into Scorpio. One of Abba’s many hits was a song called Knowing Me, Knowing You, perhaps the two divorces showed by Pluto’s passage through the sign meant that they knew too much. But world wide fame and nearly 400 million records sold is not a bad result for a Pluto transit. Just as long as we don’t assume it would have happened to everyone born with Neptune in Libra. Thanks Alice, doing fine atm. Yes 2017 was particularly good year for all of them.